Inflation is coming! Or so we’re told. Instead look at the evidence. Summary: Not a day goes by that investment or political (conservative) writers don’t assure us that inflation is coming to the US — or even here. Except when they’re warning of hyperinflation (for the right-wing its always Weimer-inflation, except when it’s NAZI-Munich). This post shows the evidence that they’re wrong, and a possible source of this hysteria. Note: if you like these articles you can subscribe using the button in the upper right corner. And recommend it to a friend. Warning signs of inflation? No. There are signs of deflation. What about rising food prices? 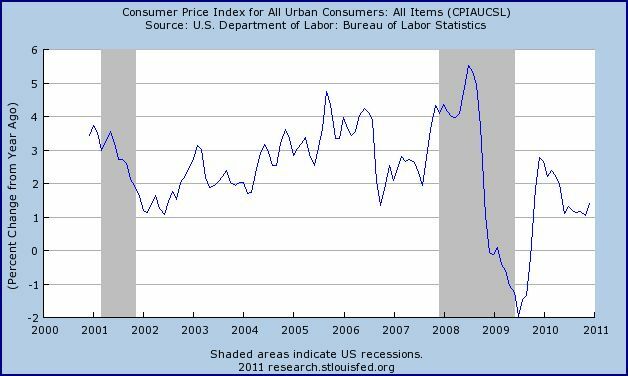 (1) Warning signs of inflation? No. Monetary inflation from the Fed printing money! Look at the line on that graph skyrocket! Or not. The slight increase since November results from QE2. 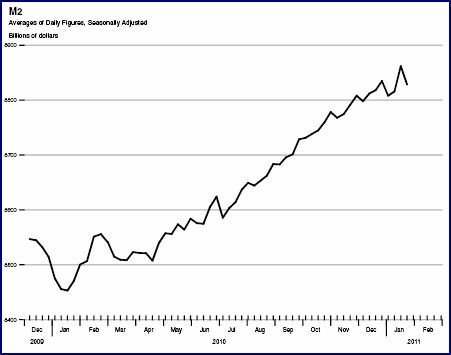 Monetary inflation show by the rapid increase in the US money supply! Look at the line on that graph skyrocket! Or not. The YoY increase in M2 is 4.3%, roughly the increase in nominal GDP (the money supply should increase along with GDP). It’s all that rampant credit creation by banks (it’s that evil fractional reserve banking system). Look at the line on that graph skyrocket! Or not. 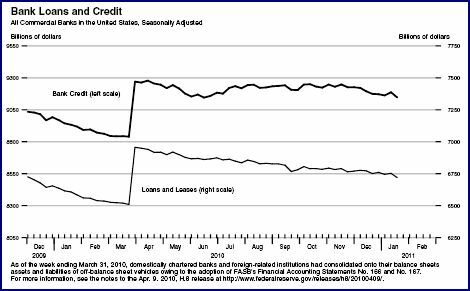 Increased bank lending accompanies all normal (i.e., sustainable) recoveries). (2) There are signs of deflation. Inflation accompanies an overheating economy. Rampant borrowing (speculator planning to repay in devalued dollars); see above. Rising asset prices (home prices are falling, our major asset class). Full employment (the US has 14 million people unemployed). The YoY US CPI has been 2% or less since the global economy collapsed in October 2008 — except for five months when the effects of the first two stimulus programs peaked (2.2-2.8% in December 2009 – April 2010). (4) What about rising food prices? 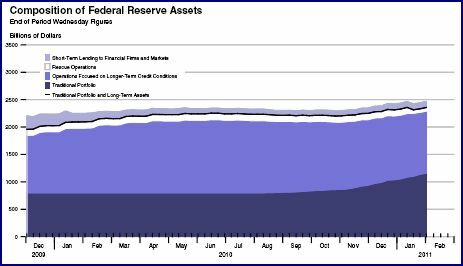 The Fed is not wildly printing money. And the Fed is just one of the world’s major central banks (China’s is by far the largest). But we’re assured the Fed is magic, forcing up the world’s food prices — directing our attention away from the dirvers of supply and demand. Rising demand from the rapidly increasing number of middle class consumers in the emerging nation (after one some of the fastest economic growth since the invention of agriculture). Calories being one of big purchases of new middle classes. 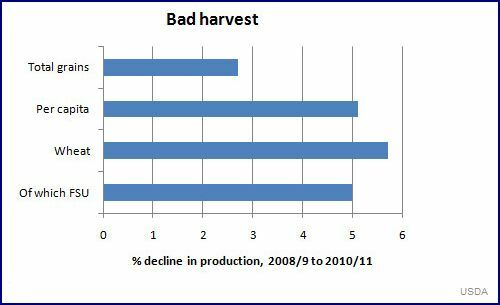 Bad weather decreasing crop yields. As always, ask who benefits? Other than Republicans seeking to discredit Team Obama (or more broadly, overthrow the current political alignment). Inflation hurts creditors. Such as the wealthy living on the interest from their municipal bonds, and retirees living on fixed income pensions. But most Americans are debtors, most of whom have fixed rate loans (such as mortgages). They benefit from inflation. The rich without debt tend to have investments in assets whose values increase with inflation (such as land and business equity). They benefit from inflation. Some Americans have little debt and few assets. Most of them are poor, and collectively have near-zero significance in our economic and political systems. Most Boomers would benefit from inflation, at least in terms of their balance sheets. But even more important the Boomers know how to manage inflation. The great inflation of the 1970’s was the Boomer’s formative economic event, the backdrop to their early adulthood — imprinting them, like new born ducks on their mother. Most missed that opportunity to get rich, either having no assets or ignorant of the game. A new inflation would be the Boomers’ last opportunity to get rich. For example by buying real assets (e.g., homes, gold, art) with fixed rate loans. They can taste the opportunity. Read conservative and investment websites and you can feel the excitement. They’re lusting for it. Krugman is our generation’s Carl Sagan, with an extraordinary ability to explain science in non-technical terms. The Un-COLA Era, 1 February 2011 — The big difference between the 1970’s and today. Soaring Food Prices, 5 February 2011 — The role of food prices in current inflation.